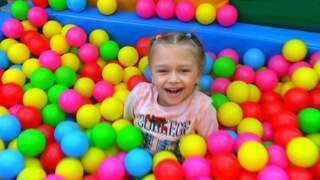 Learning colors is made more fun and easy with this video for children featuring Elli at the indoor play area. She loves going to the play center where she enjoys all the toys and the playground while learning different colors too. See her play in the merry-go-round, yellow slides, and explore the different areas of the play center while listening to the tune of If You’re Happy And You Know It. Join her in her other adventures by going to her channel at Kivitu.com today.